1) The group making the videos are “extremists”. Using this label is a cop-out. Regardless of how you wish to categorize the political stances of the creators of these videos, the content and conversations in the videos are authentic. 2) The videos are “highly edited”. So even though the content and conversations are true, your issue is with how much is left out? Well first, feel free to watch all videos here, including the the full footage of each. Next, it is common practice in investigative journalism to show just the highlights of recorded footage. Also, we know how short people’s attention spans are these days. Editing videos down to 10-12 minute segments is an online standard, and does not change the facts of the story. 3) These babies are just like organ donors. And harvesting their organs is to advance medical science you might add? This logic uses the stem cell argument and applies it to intact internal and external body parts. Furthermore, true organ donors are not killed without their consent as in the case of aborted babies. 4) It’s a women’s rights issue! What about the rights of the young woman lying chopped up in a petri-dish? You may feel her right to live is up to the mother to decide, but shouldn’t you at least grant her a proper death? 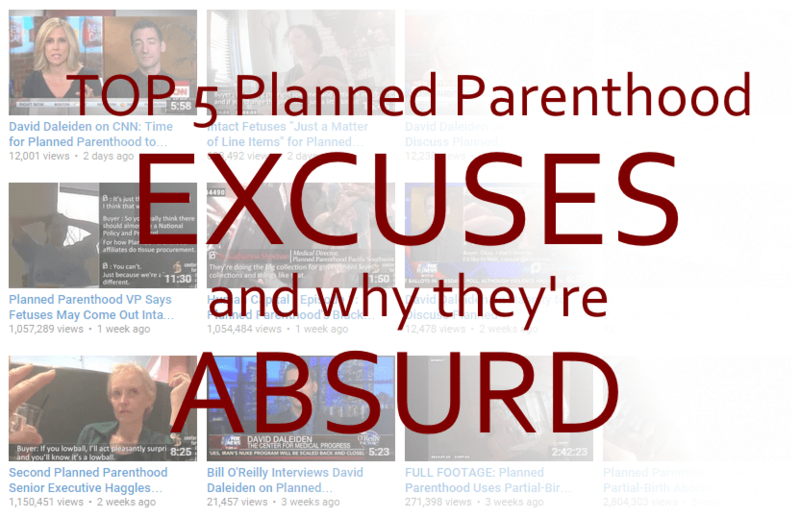 5) But Planned Parenthood does so much good. And then you cite the statistic that Abortion is only 3% of what Planned Parenthood offers for services. First, this statistic is misleading and “downright silly” (click link for more info why). Next, Planned Parenthood performs 40% of the total abortions in the U.S. — so they are by far the largest player in this field — and gets 1/3 of all of their clinic income from “procuring abortions”. Why does this issue matter to me? I would like nothing better than to have this story not be a reality and to not have to write about it. But this is not a political issue for me. This is a Gospel issue. In the Gospel, Jesus says “I died for you.” Abortion says “you die for me.” No form of abortion should sit well with any Christian, but the harvesting of body parts for compensation should alarm even the least-Christ honoring ones. As one blogger and pastor put it, this is our William Wilberforce moment.